In the United States Armed Forces, the ranks of warrant officer (grades W‑1 to W‑5; see NATO: WO1–WO5) are rated as officers above senior non-commissioned officers, candidates, cadets, and midshipmen but subordinate to the officer grade of O‑1 (NATO: OF‑1). This application differs from the Commonwealth of Nations and other militaries, where warrant officers are the most senior of the other ranks (NATO: OR‑8 and OR‑9), equivalent to the US Armed Forces grades of E‑8 and E‑9. Warrant officers are highly skilled, single-track specialty officers, and while the ranks are authorized by Congress, each branch of the uniformed services selects, manages, and uses warrant officers in slightly different ways. For appointment to the rank of warrant officer one (W‑1), normally a warrant is approved by the secretary of the respective service. However, appointment to this rank can come via commission by the President, but this is more uncommon. For the chief warrant officer ranks (CW‑2 to CW‑5), these warrant officers are commissioned by the President. Both warrant officers and chief warrant officers take the same oath as regular commissioned officers (O‑1 to O‑10). Former U.S. Army Warrant Officer branch insignia, called the "Eagle Rising"—in use from 1920 to 2004— which is still used to represent the Warrant Officer Cohort. Due to the demand for helicopter pilots in Vietnam, the number of warrant officer pilots grew from about 2,960 in 1966 to more than 12,000 by 1970. In 1973, a reduction in force began and chief warrant officer helicopter pilots were offered promotion to the rank of first lieutenant to retain combat veterans. On June 10, 1970, the Army adopted a redesigned warrant officer insignia that was easier to identify. It was a silver bar with one to four black enamel squares on it (one per level of rank). "In July 1972, Army Warrant Officers began wearing the newly designed silver rank insignia, with black squares..."
Regardless of rank, Army warrant officers are officially addressed as Mister (Mrs., Miss, Ms.). The body of warrant officers in the Army is composed of two communities: technicians and aviators. Technicians typically must be sergeants (E-5, 'NATO: OR-5) or above in a related specialty to qualify to become a warrant officer. A waiver may be granted on a case-by-case basis if the applicant has comparable experience in the government service or the civilian sector. The aviation field is open to all applicants, military or civilian, who meet the stringent medical and aptitude requirements. a. Warrant officer one (WO1) / chief warrant officer two (CW2): A WO1 is an officer appointed by warrant with the requisite authority pursuant to assignment level and position given by the Secretary of the Army. CW2s and above are commissioned officers with the requisite authority pursuant to assignment level and position as given by the President of the United States. WO1's and CW2's primary focus is becoming proficient and working on those systems linked directly to their AOC/MOS, that is, their area of concentration (officer AOC), or an enlisted rank's military occupational specialty (MOS). Warrant officers are classified by warrant officer military occupational specialty, or WOMOS. As they become experts on the systems they operate and maintain, their focus migrates to integrating their systems with other branch systems. b. Chief warrant officer three (CW3): The CW3s are advanced level technical and tactical experts who perform the primary duties of technical leader, trainer, operator, manager, maintainer, sustainer, integrator, and advisor. They also perform any other branch-related duties assigned to them. As they become more senior, their focus becomes integrating branch systems into larger Army systems. c. Chief warrant officer four (CW4): The CW4s are senior-level technical and tactical experts who perform the duties of technical leader, manager, maintainer, sustainer, integrator, and advisor and serve in a wide variety of branch level positions. As they become more senior, they focus on integrating branch and Army systems into joint and national-level systems. d. Chief warrant officer five (CW5): The CW5s are master-level technical and tactical experts who perform the primary duties of technical leader, manager, integrator, and advisor. They are the senior technical experts in their branches and serve at brigade and higher levels. They also serve as Command Chief Warrant Officers (CCWO) for large commands at the brigade level and higher. Note: Chief warrant officer six was approved by the Army Chief of Staff in 1970 with the anticipation of Congress approving two new grades, W-5 and W-6. However, Congress did not authorize W-5 until 1991 and as of January 2017 has not approved W-6. The original W-5 insignia consisted of a single silver bar superimposed with four equally spaced silver squares with each square bordered in black. In 2004, this insignia was changed to a single silver bar surmounted by a single, narrow, vertical, black stripe. The proposed CW6 insignia had two narrow, vertical, parallel, black stripes. The duties U.S. Marine warrant officers typically fulfill are those that would normally call for the authority of a commissioned officer. However, they require an additional level of technical proficiency and practical experience that a commissioned officer would not have had the opportunity to achieve. 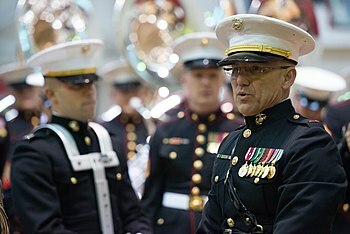 An enlisted Marine can apply for the warrant officer program after serving at least eight years of enlisted service, and reaching the rank of sergeant (paygrade E-5) for the administrative warrant officer program or after serving at least 16 years of enlisted service and reaching the rank of gunnery sergeant (paygrade E-7) for the weapons warrant officer program. If the Marine NCO is selected, they are given additional leadership and management training during the Warrant Officer Basic Course (WOBC), conducted at The Basic School at Quantico, Virginia. In the United States Navy, the warrant and chief warrant officer ranks are technical specialists who directs specific activities essential to the proper operation of the ship, which also require commissioned officer authority. 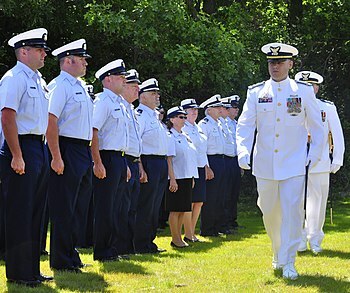 Navy warrant officers serve in 30 specialties covering five categories. Warrant officers should not be confused with the limited duty officer (LDO) in the Navy. Warrant officers perform duties that are directly related to their previous enlisted service and specialized training. This allows the Navy to capitalize on the experience of warrant officers without having to frequently transition them to other duty assignments for advancement. With the exception of the Navy's short-lived flying chief warrant officer program, all Navy warrant officers are accessed from the chief petty officer pay grades, E-7 through E-9, analogous to a senior noncommissioned officer in the other services, and must have a minimum 14 years time in service. On June 4, 2018, the Chief of Naval Operations announced the reestablishment of the rank of warrant officer one (pay grade W-1), for cyber warrant officers, and solicited applications for the rank/grade. These warrant officers will receive their appointment via warrant and not via commission. They will incur a six-year service obligation once promoted to W-1. A minimum of three-years in grade with a total service time of 12 years must be achieved before appointment and commission to chief warrant officer (W-2). However, the President also may grant appointments of warrant officers in the grade of W-1 via commission at any time as well as the Secretary of the Navy may also appointment warrant officers in that grade via commission, through additional regulations. In mid-December 2018, Navy announced that six selectees had been named. They will wear a distinctive cap badge with two crossed anchors. The last active-duty air force chief warrant officer, CWO4 James H. Long, retired in 1980. 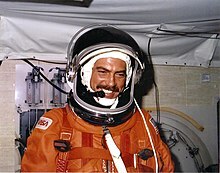 The last Air Force Reserve chief warrant officer, CWO4 Bob Barrow, retired in 1992. Upon his retirement, Barrow was honorarily promoted to CWO5, the only person in the Air Force ever to hold this grade. Since Barrow's retirement, Air Force warrant officer ranks, while still authorized by law, are not used. ^ Brackin, William L. (1991). Naval Orientation (NAVEDTRA 12966). United States Navy Naval Education and Training Command. p. 9‑9. Retrieved 13 April 2015. ^ "Warrant Officer History". U.S. Army Warrant Officer Career College. Retrieved 14 November 2011. ^ "Army Warrant Officer History 1950–1974". Warrant Officer Historical Foundation. Retrieved 17 January 2017. ^ "Warrant officers to sport branch insignia" by Sgt. 1st Class Marcia Triggs. Army News Service (April 13, 2004). ^ "Warrant Officer Assignments". U.S. Army Warrant Officer Career Center. Retrieved 16 April 2015. ^ United States Army (August 2007). "Army Warrant Officer" (PDF). RPI-938. www.usarec.army.mil/warrant. Retrieved 4 September 2008. ^ Headquarters, Department of the Army. "Military Grade and Rank", Army Regulation 600-20; Army Command Policy. Headquarters, Department of the Army. 18 March 2008. Accessed on 23 August 2008. ^ "About the Army: Warrant Officers". United States Army Recruiting Command (USAREC) and the Department of the Army. Retrieved 4 September 2008. ^ Bower, Melissa (7 April 2011). "SAMS warrant earns top rank". www.FtLeavenworthLamp.com. Fort Leavenworth Lamp. Archived from the original on 10 March 2012. Retrieved 11 August 2013. ^ https://warrantofficerhistory.org/Hist_Army_CW5_Insignia.htm. Retrieved 17 January 2017. Warrant Officer Historical Foundation History of Army CW5 Insignia. ^ "Henry Lewis Hulbert (1867 - 1918) - Find A Grave Memorial". Findagrave.com. Retrieved 23 July 2014. ^ General Emphasizes Leadership at Warrant Officer Commissioning 2nd Lt. Patrick Boyce, 8 February 2007. Retrieved 25 January 2011. ^ a b "History of the Warrant Officer". United States Army Warrant Officer Association. Retrieved 18 March 2007. ^ a b c d "Warrant Officer Programs of Other Services". United States Army Warrant Officer Association. Retrieved 18 March 2007. ^ a b . "Flying CWO Program". Public.navy.mil. Retrieved 23 July 2014. ^ "ACTIVE DUTY LIMITED DUTY OFFICER AND CHIEF WARRANT OFFICER IN SERVICE PROCUREMENT BOARDS". US Navy. Washington, D.C.: United States Government. Retrieved 8 March 2017. ^ Commission of ensign to graduates of the Naval Academy at end of four years' course, Pub. Law No. 62-98. 37 Stat. 73 (1912). ^ "Flying CWO Program". Retrieved 28 February 2008. ^ United States Coast Guard. 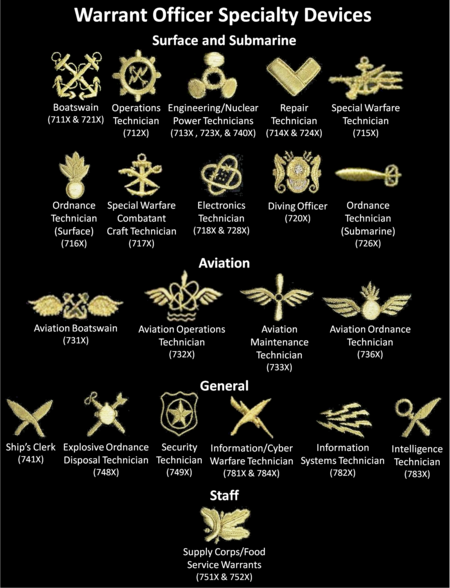 "USCG Rank Insignias." United States Coast Guard. Department of Homeland Security. website. Retrieved on 8 October 2009. ^ David F. Cooper. "Valor awards for David F. Cooper". Projects.militarytimes.com. Retrieved 23 July 2014. ^ John William Frederick, Jr. "Valor awards for John William Frederick, Jr". Projects.militarytimes.com. Retrieved 23 July 2014. ^ "TogetherWeServed - WO John LANG". Navy.togetherweserved.com. Retrieved 23 July 2014. ^ Jason W. Myers. "Valor awards for Jason W. Myers". Projects.militarytimes.com. Retrieved 23 July 2014. 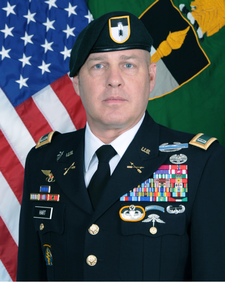 ^ "Last continuously serving draftee retires after 42 years of service". 28 October 2014. Retrieved 19 November 2014. ^ Keith Yoakum. "Valor awards for Keith Yoakum". Projects.militarytimes.com. Retrieved 23 July 2014.